InvestoFin - Finance Club of JIMS organised a session on “Portfolio Management and Mutual Funds” on 22nd March 2017, for the students of PGDM. 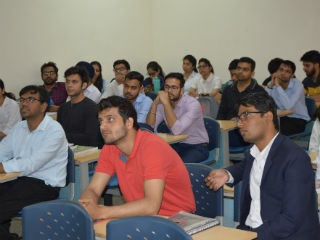 The session was organized for students who are planning to opt for finance as their major or minor specialization. 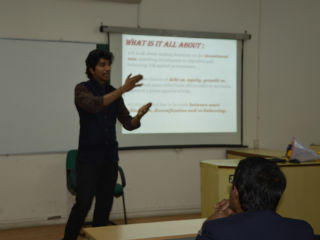 The session was conducted by Mr. Gaurav Chawla, Alumnus JIMS. He has more than 5 years of corporate experience, and has worked with different top brands like HCL and India Infoline and Big 4's like EY and PwC. The session aimed at providing an understanding of the concepts of portfolio management with a special focus on Mutual Funds. 36 students attended the session and showed active participation. The session started with the basic knowledge of financial markets and investments. The session focused on various types of avenues for investment for a healthy portfolio. The session further moved to the discussion on mutual funds concepts and benefits, types etc. Mutual fund analysis report was also discussed with the students for giving an insight of the concept. The students enthusiastically participated and asked various questions in the session. Towards the end of the session, discussion was done on the importance of reading newspapers daily and updating oneself on a regular basis for overall development. Key Learnings: Concepts of Portfolio and Portfolio Management, fundamentals of mutual funds, types, benefits, investment avenues, importance of reading financial newspaper.